This West African necklace is handcrafted by the men of Niamey, Niger using the traditional hand tools and methods that have been used by Tuareg craftsmen for centuries, and given by a groom to his future bride as a promise of marriage. I first saw this fascinating silver jewelry at a show in New York. 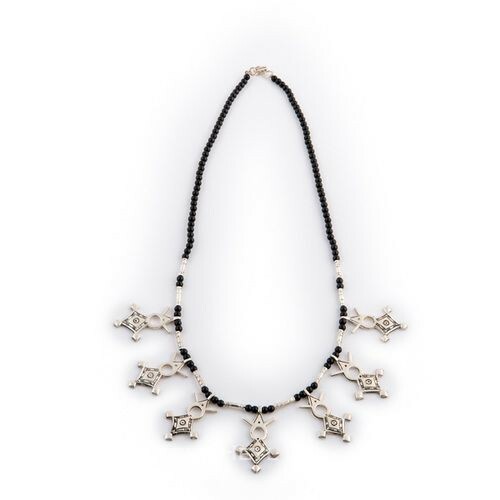 The craftsmanship alone could have earned it a place in the VirtuArte collection, but it was the story of the artisans' celebration of nomadic Tuareg history that made this necklace a must have. The men of the Koumama family begin apprenticing as silversmiths by age seven, and it's not until they reach their teens that they are able to even begin mastering the craft and offering their wares under the Koumama name. Perhaps the real reason I find their jewelry so passionate is that much of it celebrates their culture. Jewelry is considered a necessary part of everyday dress. It is rare to see a Tuareg man without a ring, an amulet or a bracelet. Women wear head ornaments, earrings, amulets, pendants, necklaces, bracelets, rings and veil weights. This necklace is associated with young love, given by a groom to his future bride as a promise of marriage. This makes it a beautifully touchable and wearable icon of love that enables one to share the Tuareg culture with the world.